My laboratory takes cellular, molecular and genetic approaches to study mammalian forebrain development. In particular, we focus our attention on GABAergic interneurons of the cerebral cortex, which are key cellular targets in the pathogenesis of multiple neurodevelopmental disorders including schizophrenia and autism. Our goal is to identify molecular mechanisms that underlie the generation, migration, and differentiation of cortical interneurons, and provide insight into how disruptions in cortical development may result in neurological and psychiatric illnesses. Time-lapse confocal imaging reveals dynamic behavior of cortical interneurons as they migrate into the developing cerebral cortex. Our laboratory recently discovered a prominent role for c-Jun N-terminal kinase (JNK) signaling in directing the early migration of cortical interneurons into and within the developing cerebral cortex. We identified Jnk1 as a positive regulator of interneuron migration in vivo, where it acts cell autonomously to promote the entry of interneurons into the cerebral cortex and the formation of coherent migratory streams. Time-lapse imaging revealed that cortical interneurons remain motile but lose their navigational capacity following pharmacologic JNK inhibition, suggesting the JNK pathway acts downstream of cell surface guidance receptors to orient the migration of cortical interneurons. A major focus of the lab is currently aimed at identifying upstream activators and downstream effectors of JNK signaling in migratory cortical interneurons. By identifying JNK activators and effectors we will elucidate cellular and molecular pathways critical for the guided migration of cortical interneurons. We are also studying the mature brain of JNK-deficient animals in order to determine the ultimate consequences for alterations in cortical interneuron migration following JNK inhibition during development. By characterizing the anatomical, physiological, and behavioral consequences of JNK deficiency, we will determine the extent to which disrupted JNK signaling compromises cortical function. Together, these studies will add key insight into genetic mechanisms underlying the formation and function of cortical circuitry in normal and pathologic conditions. Visualizing migratory properties of cortical interneurons. 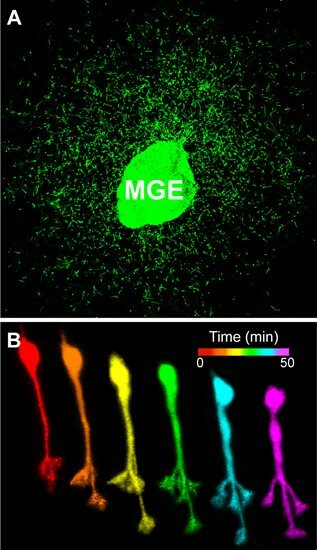 A. Cortical interneurons migrate from an explant of medial ganglionic eminence (MGE) tissue in vitro. B. Time-lapse sequence of an individual cortical interneuron undergoing nucleokinesis and leading process branching. Lucke-Wold BP, Nguyen L, Turner RC, Logsdon AF, Chen YW, Smith KE, Huber JD, Matsumoto R, Rosen CL, Tucker ES, Richter E. (2015). Traumatic brain injury and epilepsy: Underlying mechanisms leading to seizure. Seizure 33: 13-23. Meechan DW, Maynard TM, Tucker ES, Fernandez A, Karpinski BA, Rothblat LA, LaMantia AS. (2015) Modeling a model: Mouse genetics, 22q11.2 Deletion Syndrome, and disorders of cortical circuit development. Prog Neurobiol 130: 1-28. Myers AK, Meechan DW, Adney DR, Tucker ES. Cortical interneurons require Jnk1 to enter and navigate the developing cerebral cortex. J Neurosci (2014 June) 34(23:7787-7801. doi: 10.1523/JNEUROSCI.4695-13.2014. This article has associated cover art and cover video. Meechan DW, Tucker ES, Maynard TM, LaMantia AS. Cxcr4 regulation of interneuron migration is disrupted in 22q11.2 deletion syndrome. Proc Natl Acad Sci USA (2012 Nov 6) 109(45): 18601-6. doi: 10.1073/pnas.1211507109. Meechan DW, Maynard TM, Tucker ES, LaMantia AS. THree phases of DiGeorge/22q11 deletion syndrome pathogenesis during brain development: patterning, proliferation, and mitochondrial functions of 22q11 genes. Int J Dev Neurosci (2011 May) 29(3): 283-94. doi: 10.1016/j.idevneu.2010.08.005.